In this project, Sr. Betty Ann McNeil, DC traces in exact detail the roots of the entire Vincentian Family worldwide. The project shows that ninety-nine founders designated Vincent de Paul as patron of their institute, and that seventy-nine founders chose or adapted the Common Rules of the Daughters of Charity for their new establishment. Dozens of members of Saint Vincent’s own communities have themselves become founders. Click here to see the Family Tree in visual format. 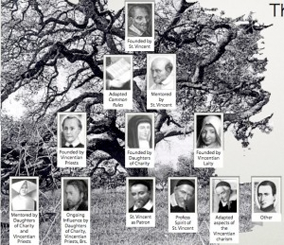 Click here to download a PDF (6.4 MB) of the full text of the Vincentian Family Tree. Click here to view the complete listing of the hundreds of Catholic Religious, Lay Associations, and Non-Catholic groups founded in the charism of Saint Vincent and Saint Louise. Their spirit has been incarnated in institutional expressions around the globe.